Explanation: A beautiful, reddened Moon slid through dark skies on April 15, completely immersed in Earth's shadow for well over an hour. It was the year's first total lunar eclipse and was widely enjoyed over the planet's Western Hemisphere. Seen from the Caribbean island of Barbados, the dimmed lunar disk is captured during totality in this colourful skyview. The dark Moon's red colour contrasts nicely with bright bluish star Spica, alpha star of the constellation Virgo, posing only about two degrees away. 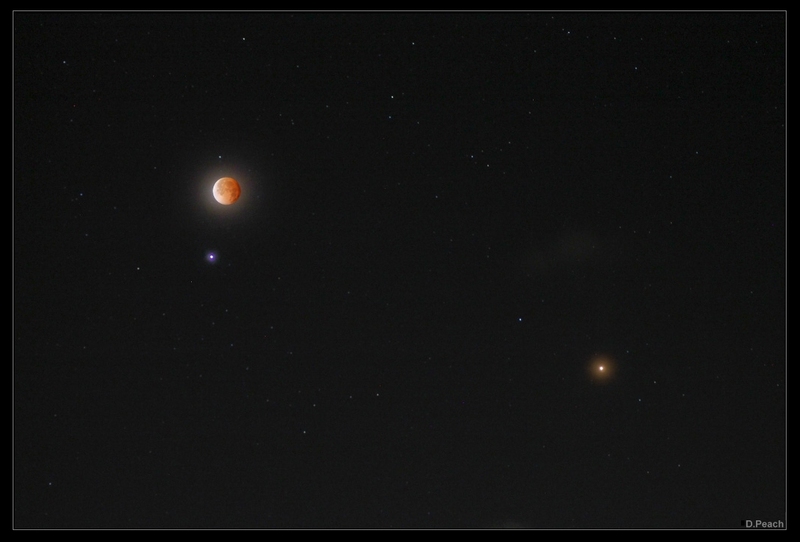 Brighter than Spica and about 10 degrees from the Moon on the right, Mars is near opposition and closest approach to Earth. The Red Planet's own ruddy hue seems to echo the colour of the eclipsed Moon.